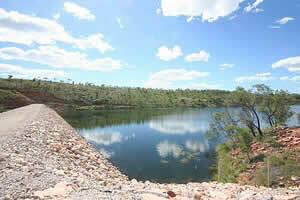 Cane toads threaten Wyndham’s water supply! Residents on ‘red alert’. 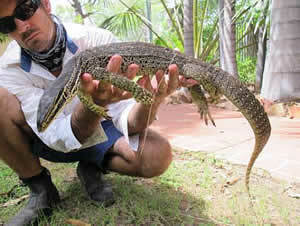 freshwater crocodile, turtles, monitor, snakes and lizards. What has been most disturbing for Kimberley Toad Busters has been the arrival of toads via the base of the Mt Erskine Range, behind the Wyndham golf course onto the King River road” stated John Cugley KTB Reconnaissance Coordinator. 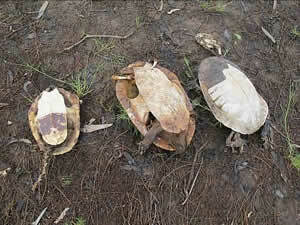 “By the time we realised they had made it to the King River road they were already well on the way to Moochalabra Dam. We have already ‘busted’ almost 300 toads from this area and hope that we have substantially reduced the number making their way to the dam but only nightly vigilance will ensure this” he further commented. 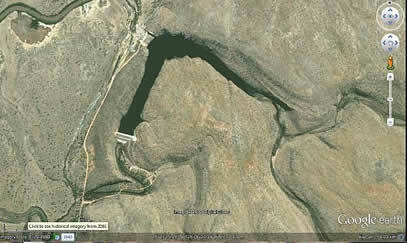 Google Map of Moochalabra Dam. “Unlike Lake Argyle, this relatively small discreet dam, if impacted by cane toads in uncontrolled numbers will have a significant impact on the dam waters and its native biodiversity. If we don’t manage to control adult toad population numbers then we will end up with uncontrolled breeding with every female toad producing as much as 35,000 eggs up to twice a year” stated Lee Scott-Virtue, President & founder of KTB. She further added “that eventually water quality will be affected, we will experience massive biodiversity loss and Wyndham will lose one of their iconic attractions, not to mention an important area local indigenous people still fish and hunt in”. "With the toads now only half a kilometre from Wyndham’s water supply Moochalabra Dam, it’s not going to be long before residents notice a distinct change in the flavour of their water. Whilst having 'bufo marinus' in the dam won't cause any problems initially to the drinking water, the moment the fresh water crocs and other biodiversity start going belly-up their carcasses will change that rather quickly" stated Ben Scott-Virtue, field coordinator for KTB. "Anyone who has had anything to do with toads will always state that when visiting a water body that has ‘un-managed’ toads in it there is a very distinct smell as opposed to a billabong that doesn't. I believe what was once the East Kimberley best tasting water will have a marked change if residents aren't vigilant" he continued. 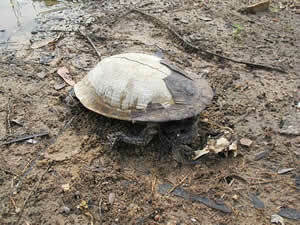 At the Parry Creek Resort near Wyndham it was found that even small numbers of cane toads impacted on some of the iconic creatures (see photo’s below) but it was also observed that if toad numbers and breeding were kept under control a reduced number of native deaths was also observed. The photo’s produced by Ebony Muirson from Parry Creek Resort shows what happens even when initial toad numbers are small. “This is only a small example of what will happen if toads hit Moochalabra dam in un-controlled numbers” commented Dean Goodgame, KTB volunteer website manager and Co- founder of Kimberley Toad Busters. “Areas that we have busted over the years that were invaded by ‘un-controlled’ numbers of cane toads witnessed a total ‘native biodiversity’ loss. To lie in a swag in one of these (total biodiversity loss) areas at night meant a good sleep because there was no sound, no scuffling of Quolls or other creatures of the night. For some people this might be a good sound. For me it means I have to keep going south, ahead of the cane toad, to enjoy the real sounds of the bush” he further stated. “The Kimberley Toad Busters have slowed them (the cane toads) down considerably allowing the native animals a bit of time to adjust and continue breeding. Some suffer worse than others, and in parts ...of Kakadu they've lost 90% to 100% of certain populations like the goannas, blue tongue, frill necks, and quolls. Government is slowing down on funding so it is hard to know what the future holds” commented Ebony Muirson from Parry Creek Resort.